I have recently discovered Asda pork ribs are fantastic and great value. The ribs are in big chunks and full of meat. The pack I bought last week was labelled as 800g but the actual weight was around 900g. 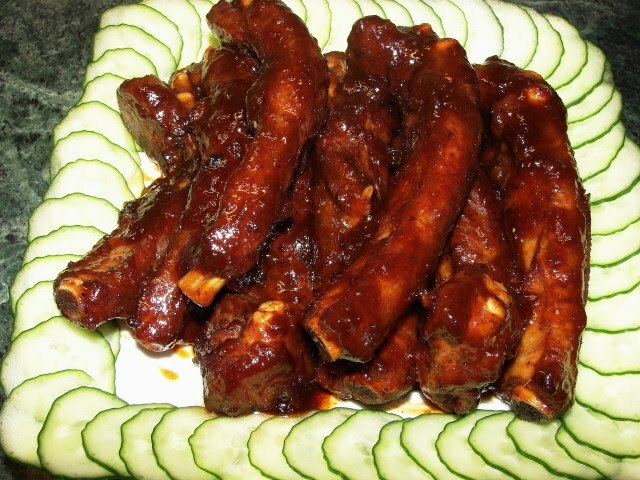 Take a look and drool at my favourite Cantonese Jingdu ribs 京都骨 . It's sticky, sweet, sour and finger licking good. Jingdu ribs are available in most Cantonese style restaurants. Most are quite red in colour due to added artificial colour. My recipe is as close to the restaurant minus the red colour. One secret ingredient I do use is bicarb to tenderise the meat. Without this the meat will be quite tough (due to the short cooking time) and not the texture like in restaurants. Mix the salt and bicarb together, rub this onto the ribs. Leave for about 2 - 3 hours. Rinse the ribs and pat dry with kitchen paper. Mix with soy, five spice, sugar, wine and pepper. Leave for about 2 hours or up to 8 hours (overnight). Heat oil in wok till fairly hot. Put in the ribs and fry at medium heat for about 12 - 15 minutes, (depending on size of ribs), turning every few minutes till brown all over. Remove and set aside. Remove oil too and clean the wok. Put in about 1 tbsp oil and fry the garlic and ginger. Then add in the remaining sauce ingredients and about 1.25 (1 1/4) cup water . When the sauce is boiling. Add in ribs, stir, cover and let simmer for 15 - 20 minutes till ribs are tender. Remove lid, stir the ribs to coat the sauce and reduce the sauce to almost dry. Then add in 1 more tbsp oil (this makes the ribs shiny), stir and ready to serve. Garnish if you like. * if you like spicy you can add some chilli sauce to the sauce. This looks really good! I am going to try it soon! Thanks! What do you recommend I could use in place of the Chiankiang Black Rice Vinegar? Would a cider vinegar work for example? Cider vinegar should be ok just slightly different flavour. You probably won't detect much of the different because of the tomato ketchup. I've been trying to recreate something similar but never knew there was black vinegar in it.